(An anti-choking device called) LifeVac claims to help choking victims by suctioning blockages from their airways, but some say it needs more testing first and now it's being pulled from several local schools. 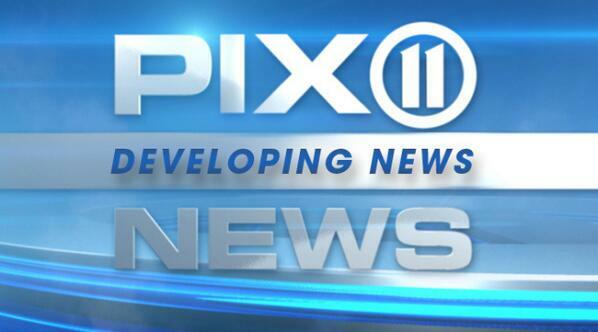 ...(Last) week Peter Heimlich, son of the inventor or the Heimlich maneuver, wrote letters to the Commissioner of the State Education Department and NYC Schools Chancellor Carmen Farina saying, "it's unclear if the device has been properly tested and/or determined to be safe." ...The DOE said it had no knowledge of LifeVac in any of it's [sic] schools and added, "The Department of Education does not recommend this device." 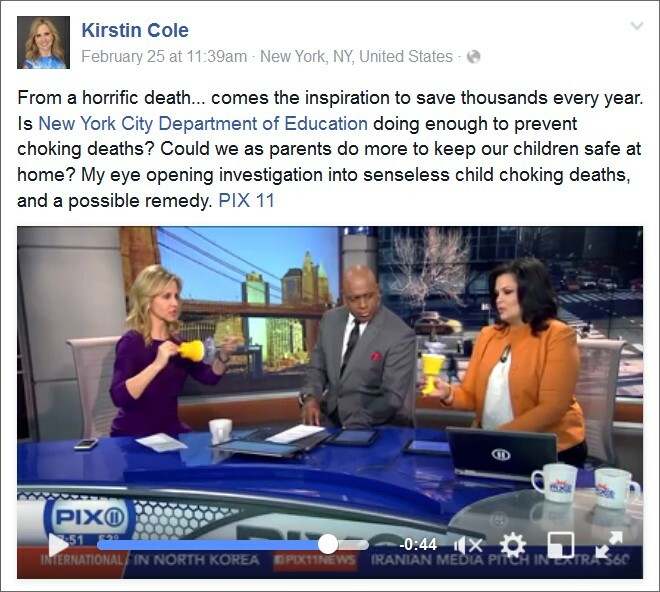 A month later PIX11 News aired Life-saving invention could prevent any more choking deaths of children in school in which staff reporter Kirstin Cole enthusiastically promoted the LifeVac, claiming it might have saved the lives of New York City public school students who died in choking-related incidents. Since her report includes no interviews from medical professionals, it's unclear how Ms. Cole arrived at that conclusion. Sukanya Krishnan: So how much do these cost again? SK: And where do you get them? KC: You get it right on (LifeVac's) website. SK: We'll attach our website to it. Kori Chambers: This could be a game changer. SK: This could be a game changer. And this really is something that every parent can have in their house as well." Prior to reporting your story, were you aware of Joe Mauceri's report last month about the LifeVac? 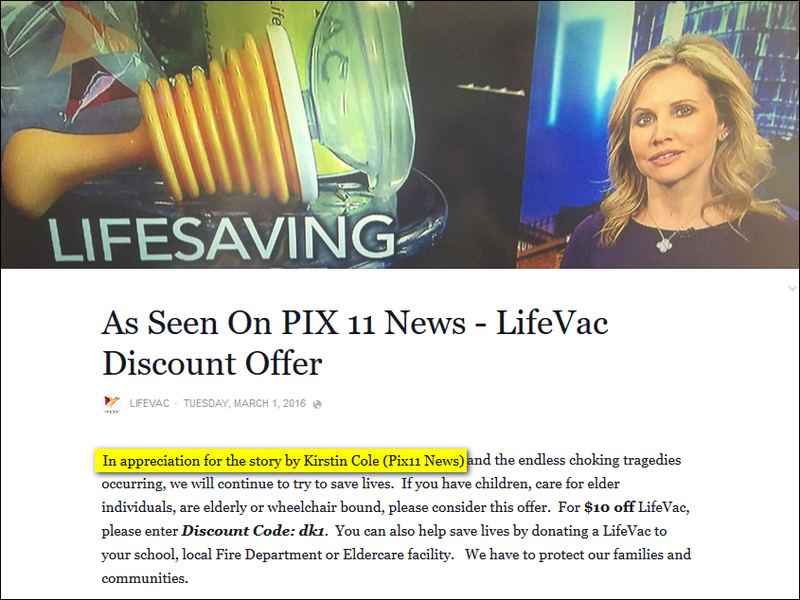 Have you ever asked any licensed medical professionals and/or leading first aid organizations (such as the American Red Cross and the American Heart Association) their opinions about the LifeVac? If so, whom did you ask and what was the response? Via e-mail, I also asked Sukanya Krishnan and asked if her statement that "(the LifeVac) is really is something that ever parent can have in their house" constituted an endorsement of the device. 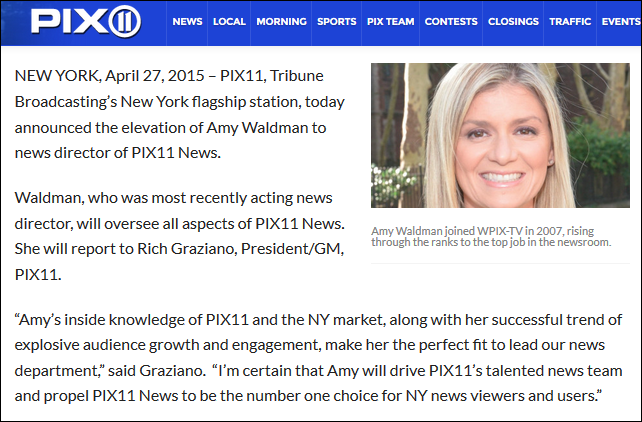 I got confirmations of receipt from both, but no replies from either, so I followed up with voice messages and e-mails to PIX11 news director Amy Waldman and the station's general manager Rich Graziano. How did Ms. Cole come to report the story? 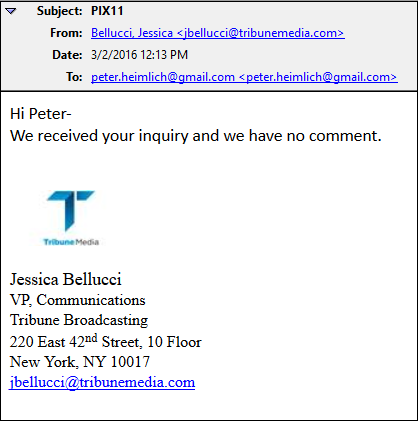 Is Tribune Broadcasting's "no comment" a sufficient response?